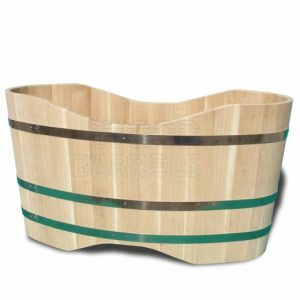 Our Wooden Bathtubs are made of wooden staves glued and bound together with hoops made of stainless steel, protected against corrosion. 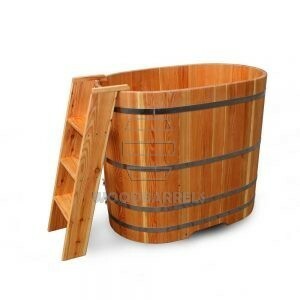 These wooden bathtubs are made of solid wooden staves of 1 inch thickness. 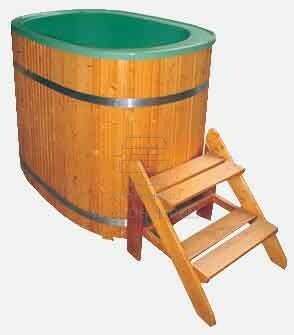 Our bathtubs are available in three different types of wood: Alder, Oak and Iroko (often referred to as African Teak).Their ends are raised by 10 cms -this enables the user to rest their head for comfortable sitting. 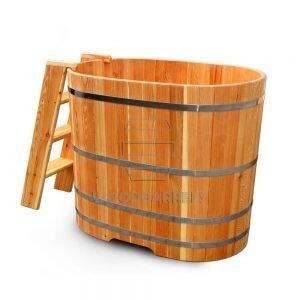 Our Wooden Bathtubs are finished with hot liquid paraffin. This requires re-applying every 6 months -one needs to place the paraffin in a bowl, then place this bowl in another larger bowl filled with hot water. This will warm up the paraffin, and warm paraffin penetrates the wood deeper. It needs applying of one thin layer with a brush and leaving to dry. Removing the water from the tub is easy with an overflow that one places over waste drains -bottom of the bathtub is placed 15 cms above the ground. The overflow is being blocked with a plug.